The data frame "Clip to Shape" feature, to hide both symbols and labels outside of a specified shape, seems to be gone from ArcGIS Pro. I'm able to use Masking (Feature Layer->Appearance->Drawing->Masking) to get the same results for the symbols, but the labels continue to be generated everywhere. Is there any way that will mask labels outside of a shape without having to actually clip the data? Per @Keagan Allan and to provide a response for the time being. It appears that this feature is yet to be available in ArcGIS Pro. In ArcMap, you could use the "Reshape Tool"
Not the answer you're looking for? Browse other questions tagged arcmap shapefile labeling clip arcgis-pro or ask your own question. 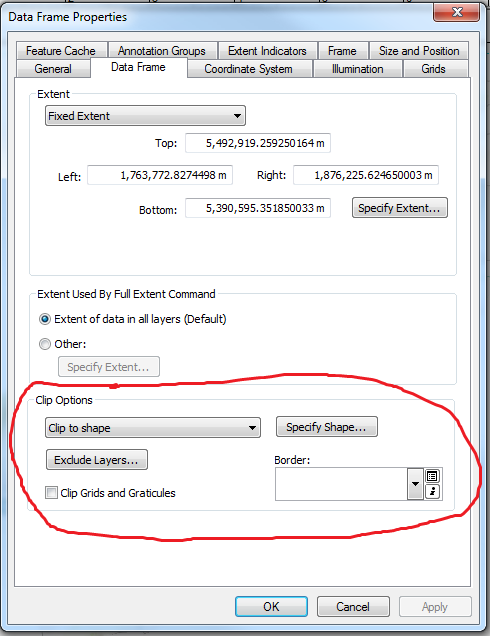 Can QGIS perform graphic clipping?